Is this Hemerocallis ‘Chicago Apache’? If there’s one thing I’ve noticed when trying to ID daylilies: some of them are very variable in form. This lovely one is in Sarah’s garden, and (when we last discussed it) she couldn’t remember which it was. I love a hunt. But when I did my searching, the aha! prompted by my discovery of the name ‘Chicago Apache’, which rang a bell, quickly turned into a… huh? I’ve never seen so many variations on so-called “scarlet.” Some show distinctly ruffled edges; some just gently crimped. Some have a white rim around the petals, some have a white rib instead. All are labeled with the same name. So, will the real ‘Chicago Apache’ please stand up? And is this one he, she, it, them? Whatever it is, Sarah was delighted to get her most blooms ever this year, which is why she summoned me for the photo shoot. In our dry shade front gardens, such a display is quite the event. I love daylilies for their multiple edible parts. But I had to laugh when I heard an exchange like this at a nursery — the worker was patiently trying to explain that there were many, many yellow daylilies and they probably couldn't id the one the woman had in her hand all by itself. Pretty sure it is not Chicago Apache. I recall almost buying it once. Hard to get naming accuracy with these red daylilies, as the deep red of this flower is so hard to capture in a photograph. 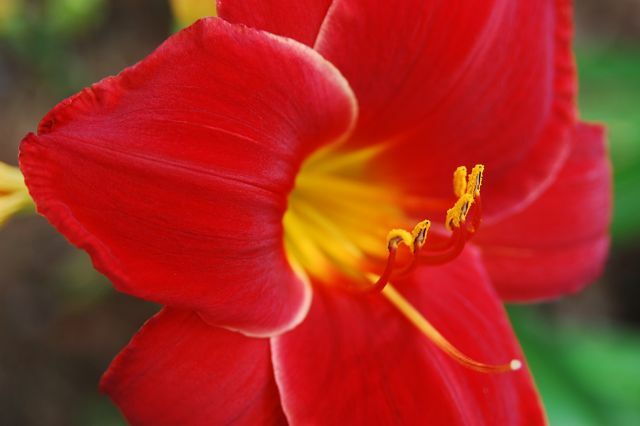 While the red here is almost there, the camera can never reproduce the depth of the velvety redness that this daylily has. 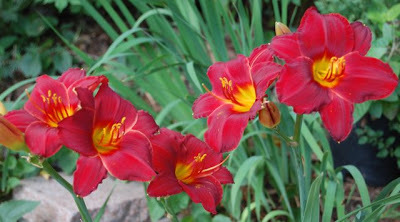 Seems like all red daylilies look alike when photographed, hence the difficulty. Just took a pic of Crimson Pirate and the reds look the same as this one, but in life they are quite different. I burned a bunch of hours on the "what's the proper name for this one" exercise back in July when I posted several daylily pix. Searching on the Web is futile since none of the photos are color-true. I went back to the daylily farm where I bought most of mine and found that there are variations in the name strains even there. In the end, I decided that I enjoyed them a lot more when I wasn't worried about their name. All of that applies to irises too. 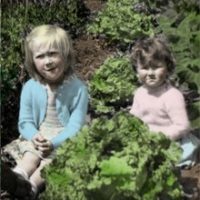 Have a fruit tree that needs harvesting?